The fall semester is ripe with tradition. Frosh. Queuing for textbooks. And the return of two longtime, popular events courtesy of the McGill Institute for the Study of Canada: the Cundill and Seagram lectures. 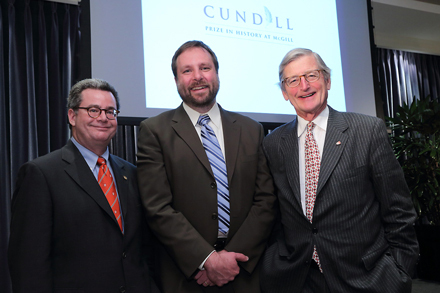 Author Stephen Platt (centre), seen here with Arts Dean Christopher Manfredi (left) and the Honourable Michael Meighen, co-chair of Campaign McGill as he accepted his Cundill Prize in History last November. / Photo: Owen Egan. On Monday, Oct. 21, Stephen Platt will deliver the 2013 Cundill Prize in History lecture at the McGill Faculty Club. Last fall, the University of Massachusetts Amherst history professor won the $75,000 prize, one of the world’s largest literary honours, for Autumn in the Heavenly Kingdom: China, The West, And The Epic Story of The Taiping Civil War. Platt’s lecture, titled “Imperial Eclipse: The Long Road to the First Anglo-Chinese War,” will take a fresh look at a slightly earlier event in Chinese history: the Opium War of 1839 to 1842. Platt eschews the popular narrative—that the Opium War marked the inevitable ascent of Britain’s military might—in favour of a more nuanced story of how decades of global forces weakened the once-mighty Qing dynasty. During the event, MISC will also announce the short-list for this year’s Cundill Prize, to be awarded at a private ceremony on November 20. Since its launch in 1997, the annual Seagram Lecture has been the site of thought-provoking commentary on everything from the Canadian Charter of Rights and Freedoms to the failure of North America in a globalized world. This year? Underdogs. On Thursday, Nov. 14, Malcolm Gladwell, author of The Tipping Point, Outliers and other bestsellers, will sit down with CBC Radio’s Eleanor Wachtel to discuss the adaptation strategies of disadvantaged people who come from behind to do remarkable things. The event will be held in Room 132 of the Leacock Building on the downtown campus. Admission to the Cundill and Seagram lectures is free. And those events aren’t the only thing to expect from MISC in coming months. Every year since its founding in 1994, the Institute has hosted a major conference on a topic of particular relevance to Canadians and policy-makers. This year’s conference, held in February, was about talent and success in Canada. Now MISC has announced the topic of next year’s conference: oil. For “Petrocultures: Oil, Energy, and Canada’s Future” (February 6 and 7, 2014), MISC will welcome, among others, Tzeporah Berman (co-founder of PowerUp Canada, an organization dedicated to rethinking energy and the environment), documentary filmmaker Warren Cariou (Land of Oil and Water: Aboriginal Voices on Life in the Oil Sands), author Mary Janigan (Let the Eastern Bastards Freeze in the Dark), economist Annette Hester and Sun News commentator Ezra Levant. For more information on the conference, and other MISC events, visit the MISC website.